The best known and busiest part of Amsterdam is Amsterdam Center (or Centre, if you’re British) — known locally as Centrum, or Binnenstad (literally: Inner city). Many, though certainly not all, of the city’s most popular tourist attractions are located within the Center. It is one of the largest and best-preserved historical town centers in the world. Within its 8 square kilometers you’ll find 7.800 monumental buildings — primarily from the 17th and 18th centuries. In Amsterdam’s medieval center the main streets of Damrak and Rokin follow the former path of the river Amstel, meeting at Dam Square — where the city originated around a dam in the river Amstel: Amstel-dam…. Amsterdam. The two streets divide the historic center into the Old side and the New Side (which, ironically, is slightly older than the Old side). Damrak starts at Amsterdam Central Station — where most travelers arrive, usually after first landing at Schiphol Airport. A portion of the center of Amsterdam, including a view of the Red Light District. The latter is located roughly between the two churches — the Church of St. Nicholas (top center) and the Old Church (center left) — and the Weighing House at Nieuwmarkt square (center right). The most popular tourist attraction in the Netherlands is a boat tour of Amsterdam’s canals. Amsterdam City Centre can easily be traversed on foot. You’re seldom more than half an hour’s walk away from your destination — though you’ll no doubt want to take more time to saunter through such popular neighborboods as De Jordaan, de Gouden Reael, Chinatown or the erstwhile Jewish Quarter. Amsterdam Center includes anything from the bustling Dam Square to the tranquil Begijnhof, and from the iconic, much sung-about Westerkerk to the notorious Red Light District. It also includes the world-renowned ‘belt of canals‘ which were recently added to Unesco’s World Heritage Sites list. Speaking of which: almost a quart (22%) of the City Center consists of water. Amsterdam Center also sports over 2.200 shops — a quart of all the shops in the city. The center is home to 81.000 people who live in 48.000 homes — of which 31% privately owned, 36% are rented from private individuals, and 33% rented from housing corporations. 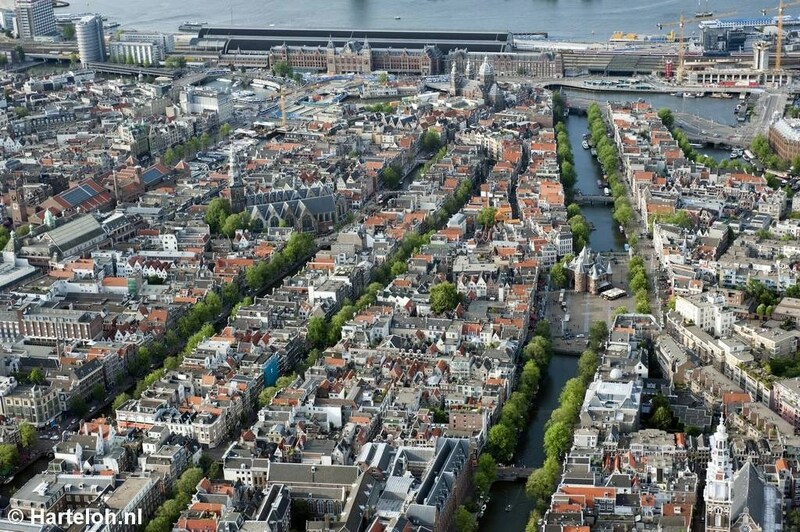 87.000 people work in downtown Amsterdam. Of all restaurants and cafés in Amsterdam, nearly half (over 1.760) are located downtown. There are also 232 hotels — two-thirds of all hotels in Amsterdam. Downtown Amsterdam is also home to many institutes of higher education, including the University of Amsterdam. 23.000 students — almost a third of all students in Amsterdam — study downtown. You’ve got to see downtown Amsterdam, but if you ignore the rest of town you’re short-changing yourself. That is one reason why various organizations involved in promoting Amsterdam — such as the Amsterdam Tourism & Convention Board, Amsterdam Marketing, and the Amsterdam Tourist Office — in recent years have started to actively market Greater- or Metropolitan Amsterdam. Another big reason? Amsterdam Centrum covers just 8 km² — and the 80.000 (and counting) people who live there, plus the 90.000 or so who work in the center, share that relatively small piece of real estate with some 11 million tourists a year. The place is getting increasingly crowded! So by all means, come and see the most beautiful and exciting city center of the world, but don’t miss out on the other areas of Amsterdam.